If you’ve never had French press coffee, it’s smooth, rich, and indulgent. Very … French. Pair it with a fluffy croissant or some crêpes Suzette, and you’ll be in paradise. Of course, this doesn’t mean you can’t have it every day. You absolutely should! But maybe you could be making it a little better. In fact, we’re sure you could. No other coffee-brewing method works quite the same way as a French press, making it a favorite among coffee connoisseurs, us included. While it does take a bit more patience than using a drip coffee maker, you can master the process in no time. Just make sure you start with a good French press coffee maker. If you’re only recently hearing about this brewing method, you might think the French press (also called a cafetière in England) is a new way to make coffee. While its origins are a bit unclear, it’s been around in various iterations for more than 100 years. The current design, however, was patented in 1929 by Attilo Calimani, who, surprisingly, was Italian—not French. The modern design itself is quite simple, consisting of a carafe (sometimes called a beaker) and a plunger assembly. 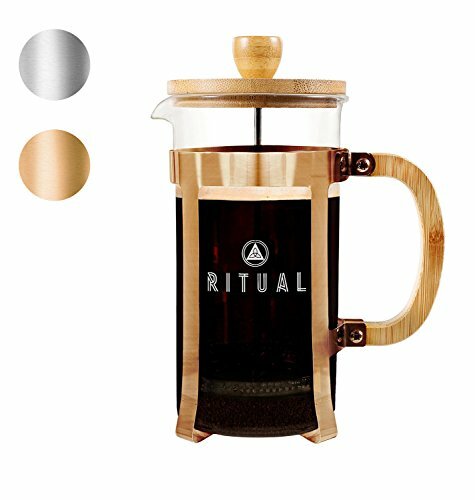 Typically made from a special type of glass, you’ll also find French press carafes made from stoneware, stainless steel, or plastic. Borosilicate Glass: This special material contains silica and boron trioxide to make it exceptionally resistant to thermal shock. That means pouring hot water into a borosilicate carafe won’t cause the glass to explode. It’s the same thing most glass bakeware is composed of. Unfortunately, if you drop your glass French press on your tile floor, the composition of the glass probably won’t help you. Stoneware or Ceramic: This less common style of French press carafe tends to be a bit pricey, but beautiful. Frequently available in a rainbow of enamel colors, stoneware and ceramic French press carafes are also internally coated to resist stains and odors. Most stoneware carafes are dishwasher safe. They’re sturdy and resistant to extreme temperatures, but also breakable. Stainless Steel: If you want a French press that won’t break easily, choose one with a stainless steel carafe. Typically, they’re double-walled and vacuum sealed, like heavy-duty travel mugs, so they keep your coffee hot for hours. 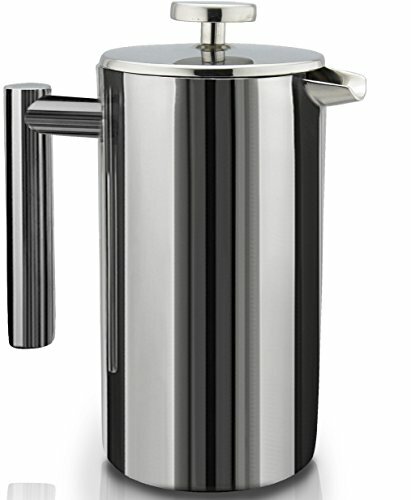 Stainless steel French presses are available in brushed or polished finishes. You’ll find some color options among the brushed finish style, while polished ones have a mirror finish, almost like fine silver. Durability will vary by model, but you can rest assured that stainless steel won’t shatter on your kitchen floor. 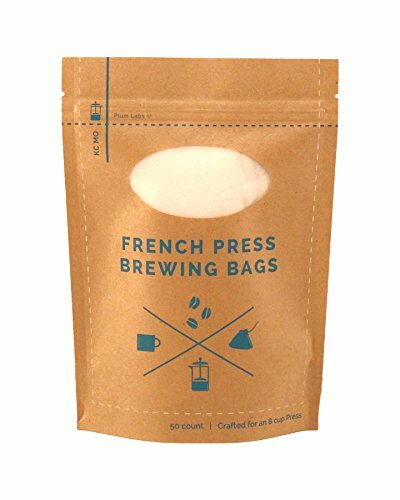 Plastic: When you purchase a French press of reputable origin, its plastic carafe will be made from styrene-acrylonitrile (SAN) and be free of bisphenol-A (BPA). SAN is an especially durable type of plastic, which will withstand high temperatures without warping or leaching chemicals. BPA has possible negative health impacts, and may find its way into food and drinks when plastics containing it are exposed to heat, such as boiling water. Since you’ll be using hot water to brew your French press coffee, be sure to look for a BPA-free carafe made from SAN. The simple mechanism inside your press is what really brings your French press coffee to life. Plunger: The way you brew the most delicious cup of coffee you’ll ever taste is the same way you get a stubborn sink to drain—with a plunger. This is one time when you’ll want to plunge gently, though. A handle is attached to the plunger rod on top of the lid, and the rod extends down through your French press and attaches to the disc and filter at the bottom. You’ll use it for brewing and cleaning. Filter Screen: The bottom end of the plunger consists of a filter and disc, which are held firmly against the glass by a surrounding spring. Some models use as many as four stainless steel mesh filters to ensure coffee grounds stay in the bottom of your French press as you plunge. If your grind is too fine or your filters aren’t fine enough, you’ll end up with a gritty brew. 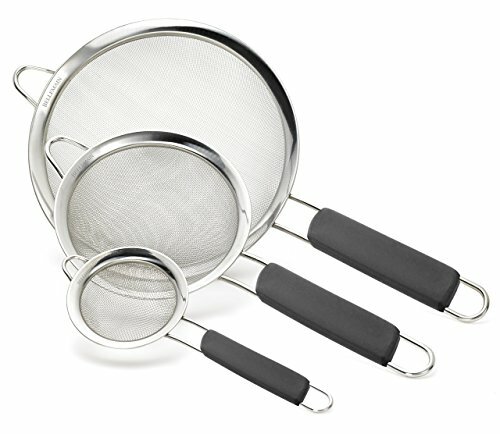 Metal filters have also been blamed for allowing cholesterol-increasing oils to stay in your coffee. If this is a concern, you can purchase paper filters or bags for your French press, which trap the oils blamed for increasing low-density lipoprotein (LDL) cholesterol. Before pressing the grounds to extract every drop of delicious oil, you’ll let the coffee steep in hot water to bring out its full flavor. It’s easy to brew coffee in a French press, but it takes a little bit of practice to brew the perfect cup. If you’re new to this method, you’ll want to learn how to grind coffee beans first. Freshly ground beans make the best coffee, regardless of the brewing method you’re using. Add coarsely ground coffee, preferably freshly roasted and ground, to your carafe. Use one tablespoon per serving. Boil the water in a kettle, then allow it to cool to 205°F. You’ll need one cup per tablespoon of grounds. Pour about half the water into your French press, and allow the coffee to bloom for one minute. Add the remaining hot water, then let it sit for at least three minutes to allow the coffee to steep. If you want a strong brew, you can let it steep a little longer. Press the plunger gently, using just the weight of your hand, as far as it will go. Serve immediately for the best flavor. Not a fan of hot coffee? Enduring a hot summer but still want to enjoy your daily coffee? Give cold brew a try. Add one tablespoon of coarse coffee grounds per serving to the carafe. Add one cup of room temperature water per serving, and stir. Put the lid and plunger back on without pressing the plunger down. Place the French press in your fridge overnight. Use your hand weight to depress the plunger and voilà! The next morning, you’ve got cold brew, French press coffee. 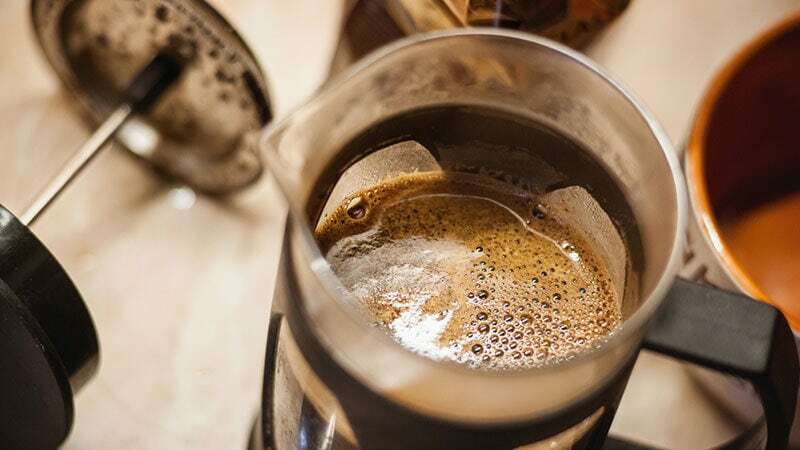 In addition to taking the time to let your coffee bloom and steep properly, you can do a few other things to ensure consistently delicious French press coffee. Rinse your French press carafe with hot water to warm it before brewing your coffee. Don’t leave your coffee in the French press once brewing is complete. Pour it into a carafe so it can’t continue brewing and grow bitter. Always use coarse grinds for French press coffee. It allows you to get optimum flavor without grit in your cup. Use one cup of water to one tablespoon of coffee grounds per serving. Balance is the key to delicious French Press coffee. Use too much or even too little water, and your coffee just won’t taste right. Keep your French press clean, so you won’t have old grounds stuck in the bottom next time you brew. We mean it—dirty coffee makers brew disgusting coffee. No matter which type you have, be sure you know how to clean your coffee maker. Coffee made in a French press won’t be tainted with mildew or limescale, like it can be in a drip machine that isn’t cleaned often enough. But it’ll still taste much better coming from a squeaky clean carafe. Most French presses are easy to disassemble for cleaning. The secret to quickly and easily cleaning your French press is having a mesh strainer on hand. Remove the plunger from your French press. Fill it about halfway with warm water. Swish the water around to loosen any coffee grounds stuck at the bottom. Hold your mesh strainer over the kitchen sink, and pour the contents of your French press into it. Now you can dump your strainer full of coffee grounds into your garbage. Even better, put the used coffee grounds into your compost. Add a little warm water and bit of dish soap, then put the plunger back in. Pump it a few times to remove oil or coffee stains. Use a bottle brush with baking soda to scrub away any stubborn residue. Rinse well, then dry with a soft cloth. If you’re short on time, most French press coffee makers are dishwasher safe. You may be risking breakage or glass etching if you rely on a dishwasher for cleaning your French press all the time, but it can be convenient for the occasional deep clean. You know enough historical tidbits to impress your fellow coffee snobs connoisseurs, plus some pro tips to brew the best French press coffee on the block. 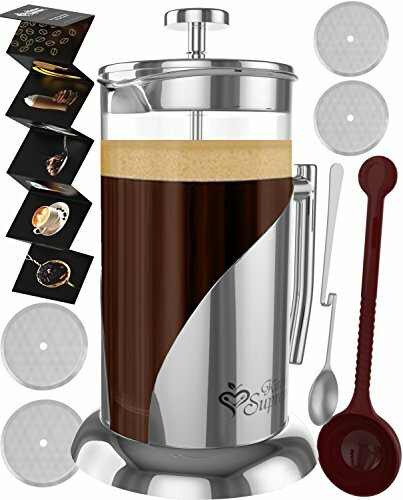 Now put it all together and get yourself a good-looking, high-quality French press coffee maker. This is our top choice for a full 51 ounces of coffee. 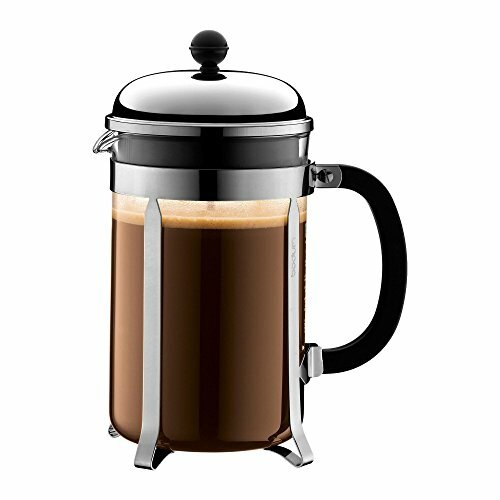 It’s a classic glass French press with a stainless steel frame and heat-safe, BPA-free plastic handle. The glass is borosilicate to prevent breakage from heat exposure. It will keep your coffee hot, while remaining safe to touch. Its three-piece mesh filter is perfect for extracting every ounce of flavor, while allowing little to no coffee grounds through. 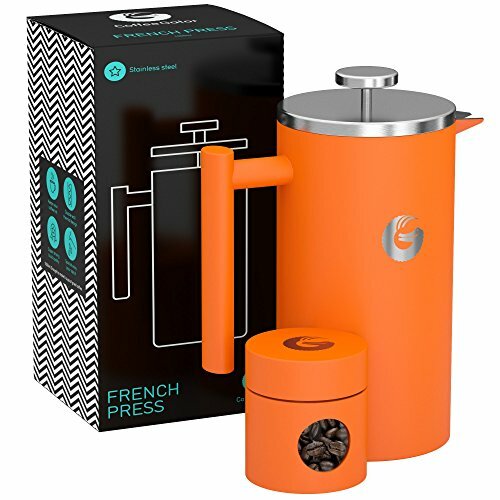 This press is well designed and easy to use and clean, making it the perfect French press for daily, regular use. 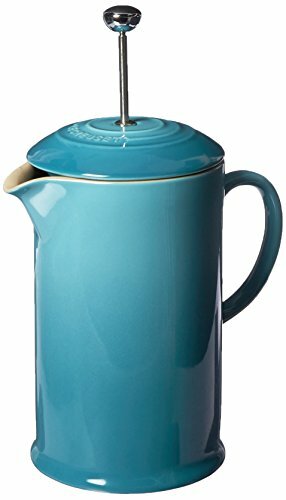 From the well-known French company that’s created enameled cast iron cookware in bold colors since 1925, this French press will fit right in among your Le Creuset pieces. If you’re not a collector, the stoneware press is still a beautiful piece for your kitchen. Its exterior enamel is resistant to odors, stains, chipping, and cracking. The glossy enamel comes in sixteen Le Creuset colors, including Caribbean, Cerise, Marseille, and Soleil. This stoneware alternative to the standard glass French press has a stainless steel plunger and mesh press, plus it’s dishwasher safe. Brew just enough coffee in the morning for two—34 ounces to be exact—in this modern, stainless steel French press. It features double wall construction for durability and insulation, plus a dual filter screen, which SterlingPro guarantees will keep grounds out of your coffee. It’s easy to disassemble and fully dishwasher safe. The stainless finish is so shiny it looks like Christmas, and it won’t ever rust. The insulated, protective frame of this press gives it a bit of artistic character. It’s available in black or red, and gives a little extra protection to the borosilicate glass. The frame is made from rust-proof material. It’s also dishwasher safe, and since the press and frame are connected, you can pop the whole thing in your top rack. The KONA French press brews 34 ounces, which is perfect for you to share. This German-made coffee maker consists of a shock-resistant glass carafe with a stainless steel frame. It comes with some helpful accessories to get you started—a long, stainless steel spoon, coffee scoop, and a recipe book. It brews eight cups of coffee, and the screen boasts four filters to keep out even the finest grounds. You’ll find little variation in style and design among the many glass French presses on the market. If they make great coffee, you don’t necessarily need them to look especially ornate. However, if you want a press that produces delicious coffee and has a distinctly stylish look, this bamboo French press is perfect for you. It features a metal frame in stainless steel or copper with a bamboo handle that stays cool, and non-slip feet to prevent accidents. The glass is thermal borosilicate that keeps your coffee hot while resisting breakage. 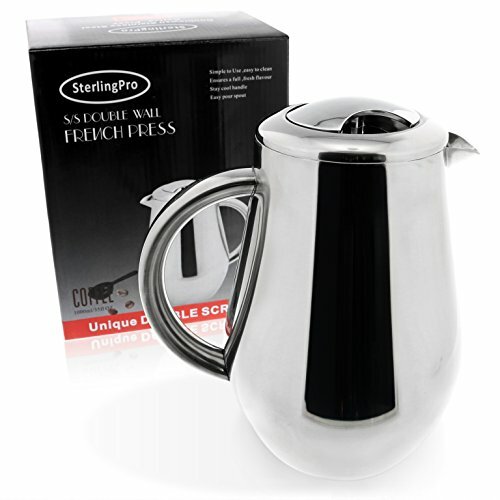 The gleaming mirror finish and curvy design of this stainless steel French press give it a unique aesthetic that looks beautiful on your counter. It holds 34 ounces of coffee, which is perfect for a couple, or if you’re single, more for you! Its double-walled stainless steel construction keeps coffee hot for hours, while keeping the exterior cool to the touch. It’s also fully dishwasher safe. It has the same SterlingPro dual screen filter as their standard press, also guaranteed. bulletproof. While it won’t actually replace a good Kevlar helmet, the military-grade metal does mean it can handle a lot more abuse than its glass competitors. You’re not limited only to shiny stainless steel, either. You can choose from matte grey, orange, or pink finishes also. The carafe hold 34 ounces of coffee, and will keep it hot for hours. 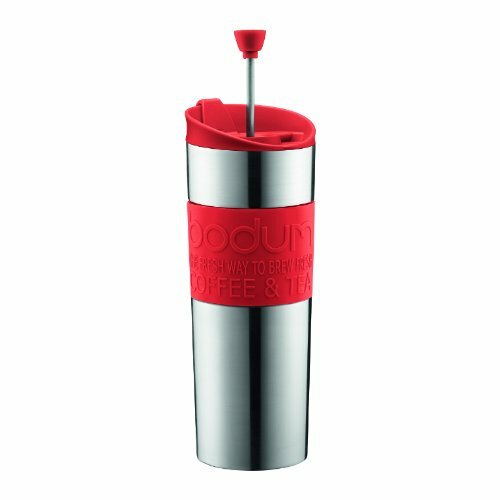 It comes with a matching steel canister, which holds enough coffee for two more cups, just in case you want a little afternoon jolt at work. All you’ll need to brew an excellent cup anywhere is coffee grounds, hot water, and this travel mug with integrated press. You use it just like a regular French press coffee maker, except after pressing the grounds all the way down, you drink the coffee straight from the cup. It’s made from stainless steel to keep your java hot for hours, plus it has a silicone sleeve that stays cool to the touch, and comes in some fun colors. 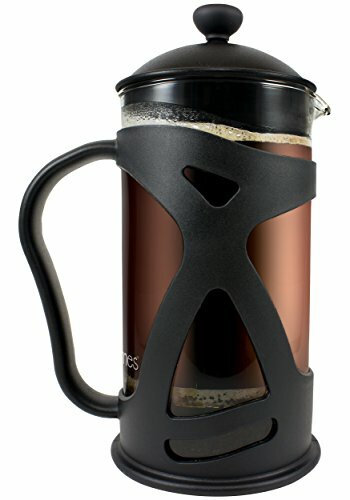 It makes 15 ounces of coffee, and is the same size as a typical travel mug, so you really can take it with you anywhere. Despite the time it takes to heat up water in a separate vessel, then allow your coffee to properly bloom and steep, you’ll find that ten minutes making yourself a cup of French press coffee is really time well spent. French press coffee makers come in so many beautiful materials and designs, it’ll be difficult to choose just one. But when you finally do choose, after a few practice runs, you’ll be able to enjoy a delicious cup of French press coffee every time you brew.